The park is about 80 miles north of Sault Ste. Marie. Stop at the Agawa Bay Visitor Center for information and informative exhibits on the area. 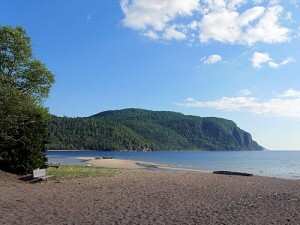 Agawa Bay also offers the largest of the three campgrounds within the park. Hikers and backpackers will have plenty of trails to keep them busy. There are several canoe routes within the park but most of them are one way trips requiring a shuttle vehicle or backtracking over your outbound route. Canoes are available for rent. 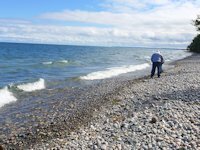 Several nice picnic areas along Lake Superior with miles of beach to comb and rock pick. RV campers should stay either at Agawa Bay or Rabbit Blanket campgrounds; Crescent Lake is more suited to tent camping. If you aren’t staying over in the park, budget a minimum of 2-3 hours to travel through the park and a few stops. Waterfall explorers should stop in the village of Michipicoten River to see Silver Falls (4 miles north of Lake Superior Park). Ambitious hikers can take the Magpie Hiking Trail along the river to Magpie High Falls. Others can take High Falls Road 2 miles to the falls and picnic area; the road intersects with Hwy 17 a few miles north of Michipicoten River. Travelers looking for lodging or a nice place to eat will have a couple of nice choices along this stretch between the park and Wawa. Stop at the Wawa Goose Visitor Center for info on the Wawa area. In Wawa, we enjoy stopping at Young’s General Store to browse and get some ice cream cones. Also fill your gas tank here because there won’t be many opportunities along the next stretch of highway (108 miles to Marathon). 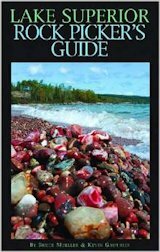 If you stop to see both waterfalls and stop at the Visitor Center and/or Young’s General Store, budget 2 hours for travel from Lake Superior Park to and in Wawa. There are two Provincial Parks between Wawa and Marathon. Their attraction is primarily for canoeing or fishing enthusiasts. For other camping travelers, we recommend bypassing these two parks for either Neys Provincial Park or Pukaskwa National Park near Marathon. Non-camping travelers who left Sault Ste. Marie in the morning should plan to overnight in the Wawa area or budget another two hours for the drive from Wawa to Marathon. Total distance from Sault Ste. Marie to Wawa is 131 miles; add another 108 if you are going as far as Marathon – and another 49 if Terrace Bay is your destination. Overnighting at Pukaskwa (see pictures and info here) is an attractive option for hiking enthusiasts who have at least a half day to explore the area. Hattie Cove is quite scenic and there are several day hiking loops available from the campground. If you are driving through and just want an overnight camp, Neys would be a better choice. 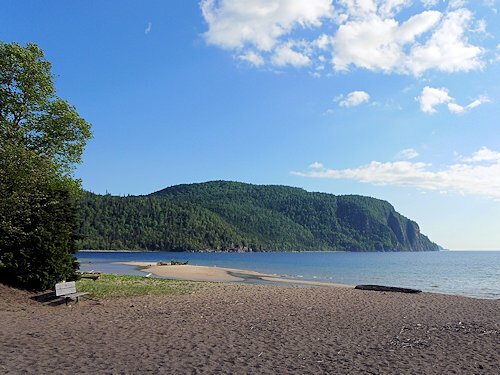 The advantage here is that your Provincial Park sticker will get you free admission to Rainbow Falls, Quimet Canyon, and Sleeping Giant provincial parks the following day. Non-campers should motel in the Marathon area or drive another 49 miles to Terrace Bay.